Who was Sabbatai Sevi, and why is his claim to be Messiah so unbelievable? Dave: Jesus wasn’t the only Messiah. Jeff: That’s what they say. Sabbatai Sevi was a 17th century Jewish teacher who claimed to be the Messiah! Dave: A messenger came before him, as predicted. Jeff: His tomb was empty, shortly after his death. Dave: And there are miracle stories – once he cursed a church and it sank into the ground. Dave: Well, his forerunner Nathan actually says he didn’t do miracles. Jeff: Oh. And though some people claim his tomb was empty… nobody saw him resurrected. Dave: In fact, Nathan says that Sabbatai is still sleeping. Jeff: The biggest problem: he was captured by Muslims who forced him upon punishment of death, to say that he was not the Messiah and that people should convert to Islam. Dave: And… Sevi did what the Muslims requested, denying that he was the messiah and telling people to convert to Islam. Jeff: That should tell us something. Jeff: If someone suggests there was another Messiah, make sure to look into all the facts before flipping out. 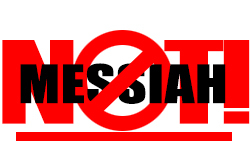 ← Is Jesus the Only Messiah?